This idea was part of an article I wrote for Christian Women Today a few years back, titled "6 Creative Ways to Develop Gratitude." I'll share a portion of the article with you in this post, as Thanksgiving is right around the corner. Hopefully you'll get some ideas to use with your family this holiday! Please leave a comment if you get any good tips! Thanks! With the busy lives most of us lead, expressions of thanksgiving to God may seldom occur outside of mealtime prayers. Words of praise find few places to surface as we scurry through our day. We manage to squeeze in time to ask God for something, but how often do we just say “thank you”? 1. Family Thanksgiving Journal. 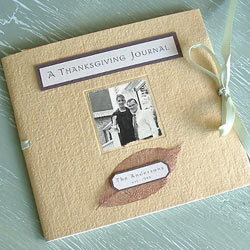 Use a notebook or blank journal to record what your family is thankful for. Add to it all year round during family devotions, or create an annual tradition where each family member contributes one message a year. Read past entries as a reminder of God’s faithfulness. 3. Table Accents. Create easy, yet meaningful favors or place cards for guests at your holiday dinner. 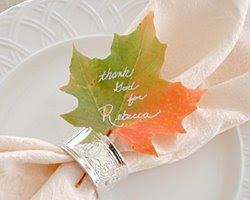 Use a paint pen to write “Thank you, God, for family and friends,” on pressed leaves. Place one on each plate. 4. Thankful Notes. Writing requires us to slow down, reflect, and choose our words carefully. 1 Thessalonians 5:11 tells us to "encourage one another and build each other up…” Thoughtfully telling people what they mean to you will build up their spirit. If you have a husband, write a letter detailing why you’re thankful for him. Find a nice quiet time to read it aloud to him. If you have children, write a letter to each of them, separately. (Write even if they are young. They’ll treasure it some day.) If you have teens, perhaps leave the letters in their rooms to be “discovered” and read alone. Identify their strengths and encourage them with appreciative comments on those positive characteristics. Keep several little note cards in supply. Then once a month, ask God to show you someone to bless — a neighbor, bus driver, scout leader or co-worker. A simple note saying “I thank God for you” will suffice. 5. Church Staff Appreciation. Many churches now celebrate a Pastor appreciation day, but what about those serving behind-the-scenes? Galatians 6:10 says, "As we have opportunity, let us do good to all people, especially to those who belong to the family of believers." Gather a few church friends and assign one staff member to each. Each friend brings a card and a baked good to her worker on behalf of everyone. 6. Thankful Box. Purchase a small decorative box or wrap a shoe box with pretty paper. Put a notepad and pen inside and set it on your dresser. Every time you’re angry with a person or situation in your life, write a note to God before you go to bed that night, expressing why you’re thankful for that person or difficulty. Use these slips during future quiet times to randomly select someone or something to pray for. These outward activities serve to change us inside, to change our hearts. An earnestly developed attitude of gratitude will be reflected in our private walk with God. Be encouraged to “enter his gates with thanksgiving and his courts with praise; give thanks to him and praise his name” (Psalm 100:4). To read the article in full, please see it on this page at Christian Women Today. Thank you to everyone who entered my giveaway to win a set of my new retro inspirational note cards! The winner is #63 "Jenna" who wrote "I love May Your Cup Overflow and Bless Our Nest. Well, really, I love all of them!" Congrats, Jenna!! Please see my notes about paint pens in the comments! I am wondering where you get your paint pens and how much they cost. I'm sure it's somewhere quite normal, but I haven't just seen them around. 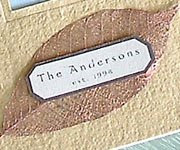 I love your leaf name card ideas. The paint pens I have are Elmer's brand "Painters." They come in different widths, like Ultra Fine and Medium and they say 'Opaque Paint Marker." I've had them a while, but I think I bought them at Hobby Lobby. I've used gel pens, too. Some of these aren't as opaque, so test first. It's hard to see in the red leaf photo, but I used a gold gel pen to make dots around the leaf edge. Note: Most paint pens require you to press down hard on the tip to get the paint flowing, so do that on a scrap paper before starting your project. And usually throughout the project, too, to keep the paint flowing smoothly. i really love those! i just might do that this year! thanks for the idea! Love the ideas, thank you! What wonderful ideas! I love it. Your blog and your projects are just lovely. Thanks for visiting mine, too! This is SUCH a fantastic idea! I'll be linking to this in my Thanksgiving Roundup. What wonderful ideas! I'm going to try some of these. Thanks!